The work of two Bemidji State researchers will be featured on a “Prairie Sportsman” episode airing March 31 on Lakeland Public Television. 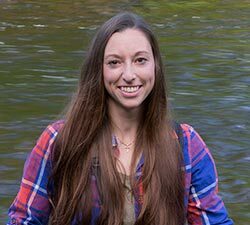 In August, BSU News featured Katti Renik’s work to analyze 30 streams and 10 beaver habitats in Minnesota’s North Shore region during the summer of 2017. 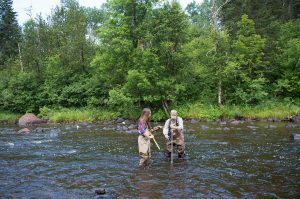 Dr. Andy Hafs, assistant professor of biology, and Katti Renik, a biology graduate student from Bridgeport, Neb., are conducting a two-year study in northeast Minnesota on the relationship between beavers and brook trout. Hafs worked as the primary investigator while Renik has led the study’s field research. “The research is designed to determine how beavers influence the brook trout population since sometimes they conflict with each other,” Hafs said. With more than 1,500 miles of designated trout streams in the region being studied, Renik is sampling and measuring conditions in about 80 streams and beaver ponds through next summer. The analysis will help natural resource managers determine which, if any, beaver dams need to be moved. The cool temperatures are ideal for native brook trout that cannot tolerate temperatures warmer than 75 degrees Fahrenheit. Beaver dams can potentially impact trout streams by warming water temps and increasing sediment and erosion. But the dams also create critical habitat for waterfowl, moose, frogs and other wetland wildlife. The episode of Prairie Sportsman featuring the BSU research follows the travels of host Bret Amundson to Sax-Zim Bog in northeast Minnesota, called the Arctic Riviera, where the Great Grey Owl and hundreds of other birds winter. In the early 1900s, there were failed attempts to drain the bog, located between Duluth and Hibbing. What remained were roads, hay fields and meadows filled with voles that owls and other raptors came to feast on. The bog now draws thousands of photographers and birders annually from across the United States and other countries. “Prairie Sportsman” will air at 2:30 p.m. March 31 on Lakeland Public Television. “Prairie Sportsman” is produced by Pioneer Public Television with funding from the Minnesota Environment and Natural Resources Trust Fund. The series first aired on Pioneer on Feb. 25 and also is available to view online at prairiesportsman.org. It will also air on KSMQ-TV, Austin, and Twin Cities Public Television. Prairie Sportsman celebrates Minnesota’s love of the outdoors and the hunting, fishing and recreation opportunities provided by the state’s vast resources of lakes, rivers, trails and grasslands. The program aims to encourage more people to become environmental stewards as they enjoy the natural world. Prairie Sportsman is produced by Cindy Dorn and filmed and edited by Dylan Curfman, Tim Bakken and host Bret Amundson. The 2018 season is made possible by funding from the Minnesota Environment and Natural Resources Trust Fund, SafeBasements of Minnesota, Live Wide Open and Western Minnesota Prairie Waters Tourism. Established in 1966, Pioneer Public TV is an award-winning, viewer-supported television station dedicated to sharing local stories of the region with the world. For more information visit pioneer.org.